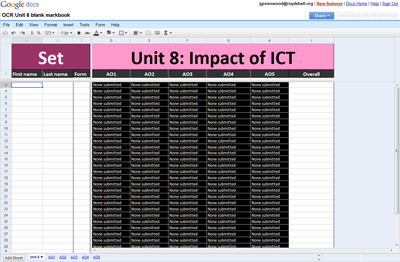 A while back I posted a Google Spreadsheet markbook for OCR Nationals level 2 ICT’s oh-so-exciting unit 1. 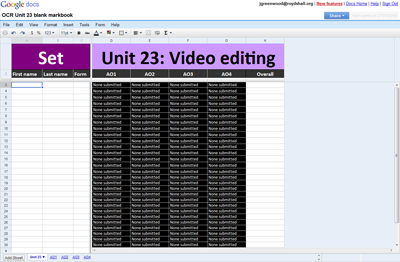 Since posting this as a resource, I’ve updated it to plug a couple of holes (the original markbook was missing multiple recipients as a pass criteria for AO2) and created markbooks for the other units we teach. See below for links. 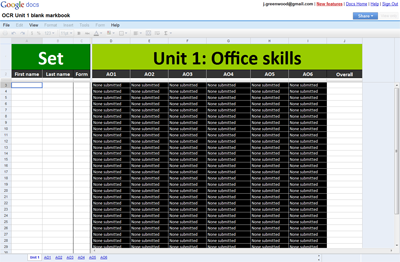 You need to have a Google Docs account in order to save a copy of the spreadsheets in order to enter your data. There’s nothing terribly sophisticated about them, just a combination of conditional formatting, IF statements & Google’s handy “publish as webpage” feature, but they’re a very simple way to represent progress in an easily understandable way, and have helped my students a lot. It also cuts down on the amount of formative feedback necessary, so I can limit my comments to covering quality & content. I’ve put the short walkthrough of how to use them effectively at the bottom of the post. On the first sheet the only things you need to fill in are students’ names and forms – these are then referenced on each subsequent sheet. The front sheet contains conditional formatting in the form field to correspond with my school’s community colours – you may want to remove that. Thank you so much for these free resources! This is great is there one for Level 1?